The new 'T9' 4-4-0, No. 312, passes the sidings with an Up passenger train. '0345' 0-6-0 No. 3441 has been shunted into the Down goods siding to clear the line for a passenger train, which can be seen in the background about to depart Poppingham station. This train is also 'T9'-hauled; No. 304 this time. And, in the Up goods siding, a S&DJR 0-6-0, No. 66 of 1896 and later rebuilt to the condition seen here, waits to continue its journey. We have a shortage of Southern locomotives, so the S&DJR helps out as and when required. There is actually a '700' Class 0-6-0 'Black Motor' in one of the locomotive drawers but, unfortunately, she is in BR livery and not suitable for pre-1939 running. Many thanks, Alec. After years of 'walk-around' layouts, the Table-Top Railway is designed to be operated sitting down. I have taken careful note of Iain Rice's ideas on 'controlled sight lines' and intend (hope?) 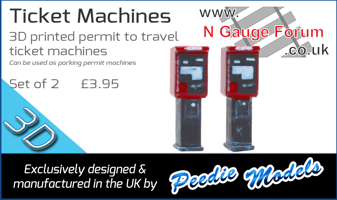 to incorporate these in Poppingham. Have you got the prial of sevens, or just a nameplate? Just the nameplate, I'm afraid. If another manufacturer decides to make Union Mills-ish locomotives* with outside cylinders, then a 'King Arthur' would be high on my 'hope-for list'. Incidentally, I read an article in a magazine recently which referred to No. 777 as 'The Pile of Sevens'. Presumably, the Southern enginemen's reference was lost on this modern author. * Maybe Dapol will pull this off with the metal-bodied Bulleid 'Light Pacific' - I certainly hope so. Yet another lovely photo John. 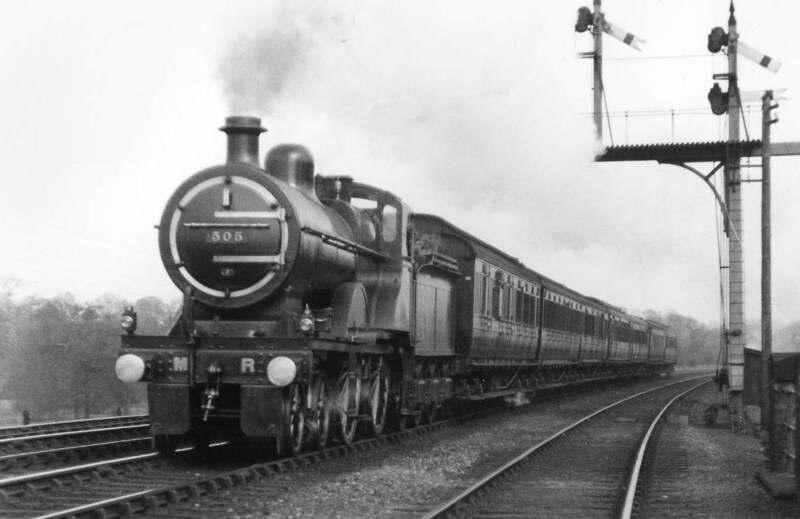 It was in the summer of 1928 that the 'Wee Black Yins', officially the LMS '2P' class, came to the old G&SWR district of the Northern Division. Good engines they were too; economical both to run and to maintain. They were needed though; the old G&SWR locomotives were getting worn out and those rebuilt by Mr Whitelegg were very weak. The '2P' class remained, particularly in Ayrshire, until the terrible twins of dieselisation and line closures sent them for scrap. Yes, you've probably seen her before. She featured on @Ozymandias ' workbench thread. And hasn't Gideon made the most absolutely wonderful job of her? She's finished in the condition shown in Mr Smith's photograph and the efforts of these Ayrshire enginemen of so long ago can, once more, be appreciated. She's a Union Mills locomotive and was in British Railways livery before her transformation. 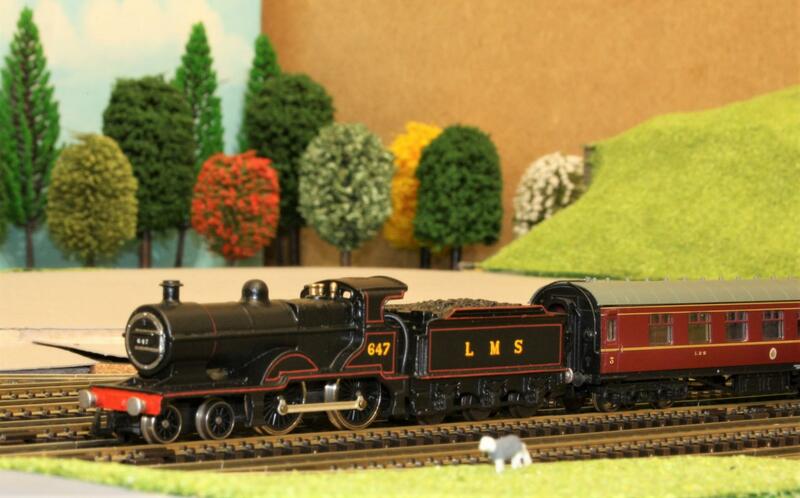 My thanks to Gideon and to Union Mills for enabling me to have this 'Wee Black Yin' on the Table-Top Railway. I should like to dedicate this post to the memory of David L Smith, whose writings lit a flame in the heart of a little boy who arrived just too late to appreciate steam at first hand. That flame burns still. With the very best of good wishes. Seconded, in every respect. It's well worth waiting for Gideon to work his magic on a Union Mills loco. I have to confess that I'm very taken with that engine no. 647. How very smart it looks. I know you love your steam trains John and I can appreciate that one in particular would give you much pleasure in whizzing her around Poppingham. Very grand indeed. She looks fabulous in situ! I'm so glad you're pleased with her. Thank you, Nick, for that lovely picture of No. 505. I'm using the term 'semi-scenic' to describe the Table-Top Railway. I don't think that I have seen the term used before, but it almost certainly has been. 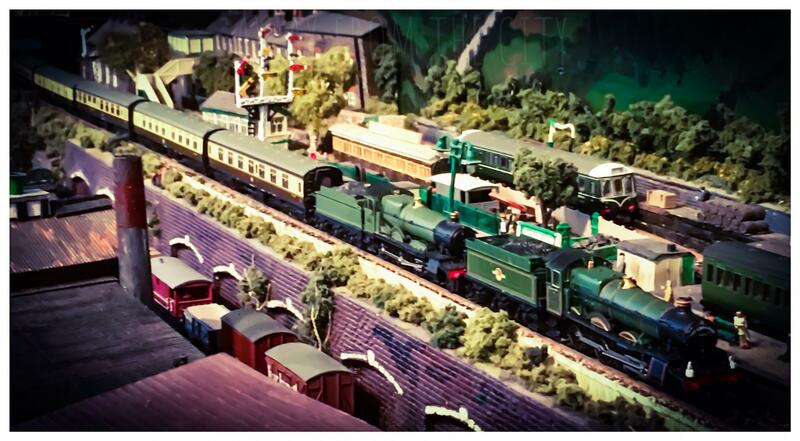 I use the term in full recognition of the wonderful tradition of fully-scenic modelling started by the likes of WS Norris and JH Ahern. On our Forum, you'll see fantastic inheritors of this tradition, such as Wrenton and Port Perran/Trepol Bay. But back in the period (roughly) from the 'twenties to the 'fifties, many wonderful layouts were a little less developed in matters of scenery. That's the look that I'm struggling to achieve on Poppingham. But I endeavour to persevere! 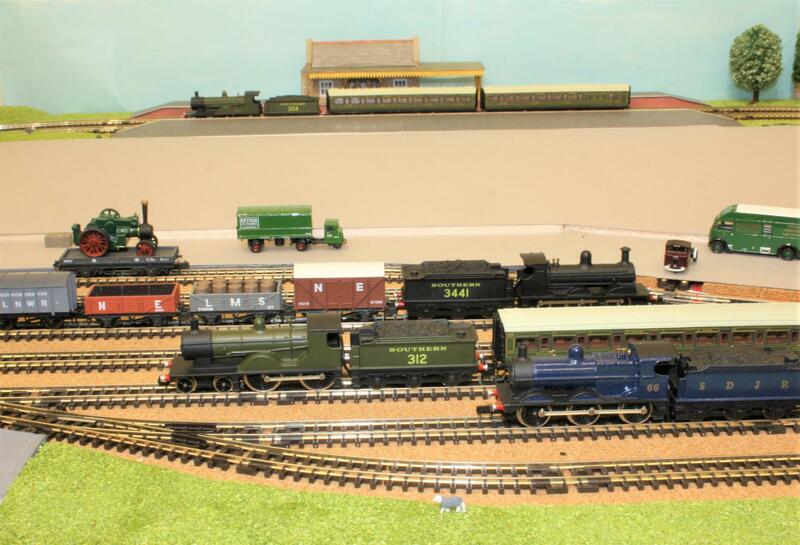 The layout is the late Norman Eagles' Sherwood Section and this is 'Rufford Market' station. Sherwood was '0' gauge clockwork and was in existence in one form or another from the 'twenties to the 'eighties. What a layout! 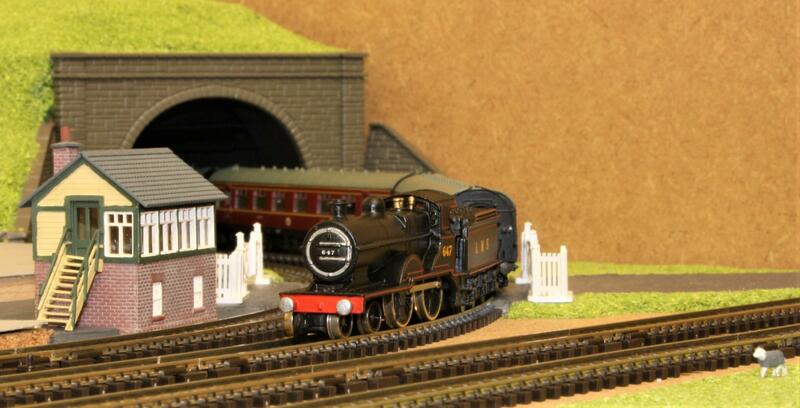 This is the sort of thing I have in mind as I build my layout in British 'N' gauge. If you have the Railway Modeller of October 2017 (Vol 68, No. 804) to hand, there is an excellent article on the Sherwood Section on pages 852-855. Looking forward to Gala photographs later John. Seconded! I hope the organisers have a lovely, sunny day for it.